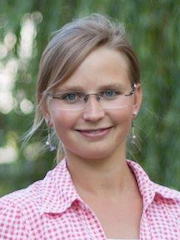 Julia Drewes is PhD student in the International Research Training Group "StRATEGy" and holds master degrees in Environmental Science and Physical Geography, which she studied at the University of Leipzig with specialization in geophysics, climatology and natural risks, and geoinformatics. During her study, she worked as a student assistance at the Climate Office for Central Germany at the Centre of Environmental Research UFZ and on scientific issues influenced by climate change in the fields of biodiversity, phenology as well as agricultural drought events. The latter was in focus of her first master thesis. Her second master thesis concentrated on a geoelectrical monitoring concept for a CO2 capture and storage site in Canada in cooperation with the German Research Centre GFZ. She is now staff member of the Geohazards working group at the University of Potsdam. Julia Drewes is "StRATEGy" PhD speaker and in the PhD-Day organization committee at the University of Potsdam.